The 2017 Lift Campaign totals are in! We set out to raise $20,000 in this year’s campaign for our charitable partner, Kulture City, and we are humbled and elated to report that we not only met that goal, but we pretty much blew it out of the water! 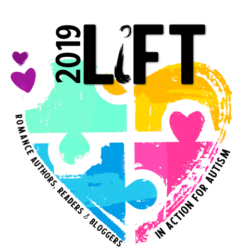 Thanks to your donations of books and bookish items, your bids in our auction, your purchasing of the Lift Anthology and our Lift Wear, we are thrilled to report that this year’s campaign has raised $24,000! By supporting Kulture City’s lifeBOKS program, which provides families with free kits to curtail wandering, a common and potentially life threatening challenge. The money we raised will make a lasting impact, touching real families who need help, and none of this could have happened without your support. We want to thank our amazingly generous author and blogger friends who donated their time, their work, their books and their platforms to this cause. We want to thank the readers of this beautiful romance community who both volunteered their time, whether by assisting with the campaign or simply spreading the word through social media on their own, and bid on items in this year’s auction. Many of you donated directly to Kulture City, too, and we are forever grateful for your monetary support. While the campaign has come to a close, we are leaving the LIFT wear site open for last-minute purchases through May 26th. This is the last call to get 2017 LIFT shirts, mugs, stickers and totes. All profit from these sales will go directly to Kulture City. You can find LIFT wear here – https://teespring.com/Lift2017. The YA fantasy anthology, Ever in the After, is also still available for purchase here – http://buff.ly/2kM0D2j. All royalties from this amazing read brought to you by 13 talented YA fantasy authors goes to Kulture City as well. This year has definitely raised the bar, and we look forward to reaching higher next year. While the campaign has closed, your support of ASD families and for spreading the word on autism education and acceptance is appreciated all year long. We look forward to kicking off the 2018 campaign next spring, and we’re already kicking around some new ideas to make next year even bigger! In the meantime, we leave you with our most heartfelt thanks, on behalf of everyone whose lives you’ve touched. One last note! Winning bidders, you should have heard from the donor about the items you won. If you have not, email us at liftauction@gmail.com so we can ensure your donor has been notified.